I dabble in gardening over the course of each year. It’s hard to do much with a small patio, but I have three earth boxes and sundry pots. I’d like to say I grew eight trees for Earth Day, as I have four grapefruit and four lemon seedlings at the moment. They are healthy and green little babies. But I didn’t grow them for Earth Day, I just happened to be growing them on Earth Day. For me, every day is Earth Day. I love plants, and I love helping them grow. I also love reaping the benefits of my hard work. Sometimes I barely do any work. 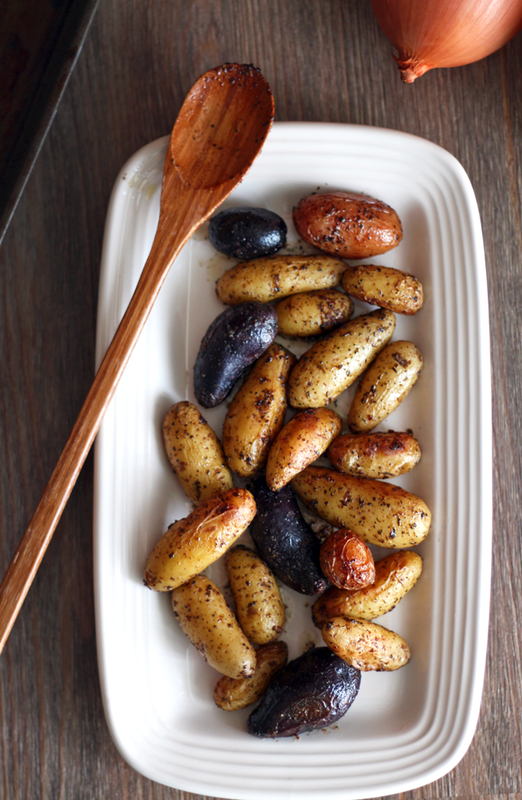 Let’s take a look at my pot of baby potatoes, which inspired me to make this dish. I had a bag of sprouting red, gold, and purple potatoes last year, so I cut them up and buried them in a pot full of yummy soil (for the plants, that is). It took awhile, but they eventually sprouted beautiful, green stems. These stems were yummy, too (for the snails, that is). When we moved in to our new apartment in December, the potatoes weren’t ready yet, so I had to move them to my new patio. After a month or so of little progress, they were viciously eaten by an onslaught of hungry, slimy snails. The green stems were completely gone. I considered my potatoes eliminated, finished. This month, however, as I was getting that pot ready for replanting, I found buried treasure in the form of cute little colorful potatoes! I was absolutely amazed. They had been abandoned by me. How did these little potatoes not get eaten by insects, sprout, or decompose? They were full, healthy potatoes that had survived for months, just waiting to be dug up. Plants are truly amazing. I didn’t quite have enough to make this full dish, but I supplemented with store-bought potatoes. 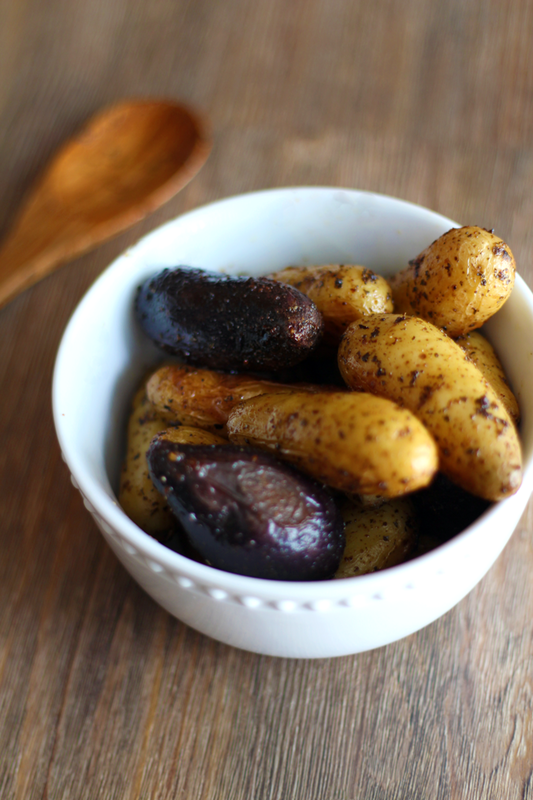 I was very much inspired by my garden to make this flavorful, buttery roasted potato dish–dairy free and yummy, too (for the humans, that is)! 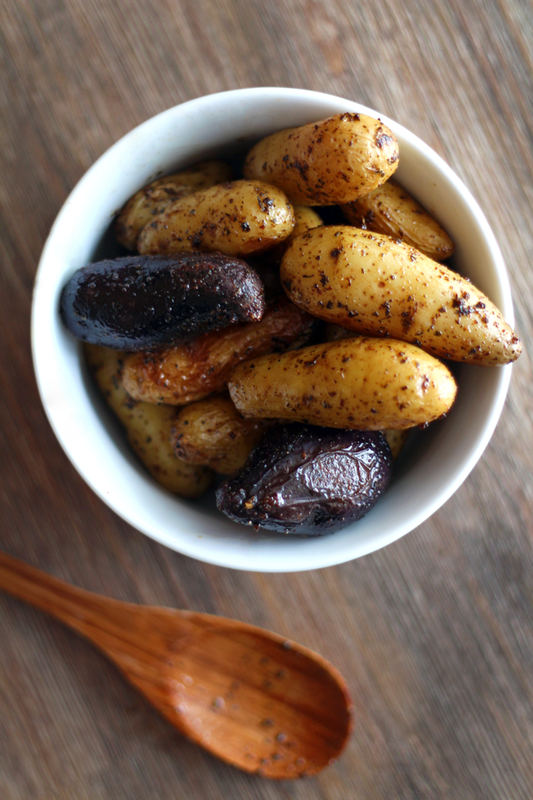 Rinse potatoes and scrub if needed, lightly drying on a cloth or paper towel. Drizzle olive oil on the bottom of a large baking dish. Add potatoes and stir to coat in olive oil. Then add black pepper, basil, garlic powder, and sea salt. Stir to coat. Top with 3 tablespoons (dollops) vegan butter, evenly spaced to melt when baking. Cover dish with foil and bake for 40 minutes, stirring once halfway through.